In the past, I've not been a huge fan of yellow, but there's something so soft and warm about Pion Design's shade of yellow that I just can't resist! 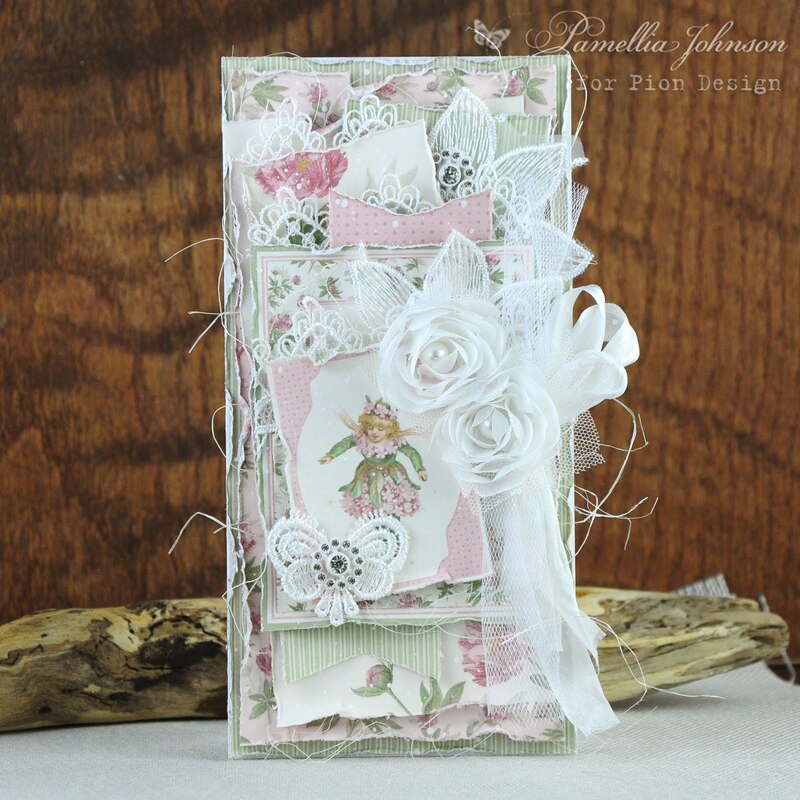 Today's card is made featuring the new collection "The Songbird's Secret". 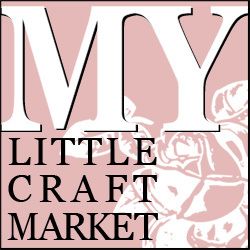 The Chloe die is Memory Box, the leaves are Cheery Lynn, the flowers are Wild Orchid Crafts, the decorative pins are hand made, everything else is from my stash. I hope everyone is having a wonderful week so far. It's been quite windy outside this week. 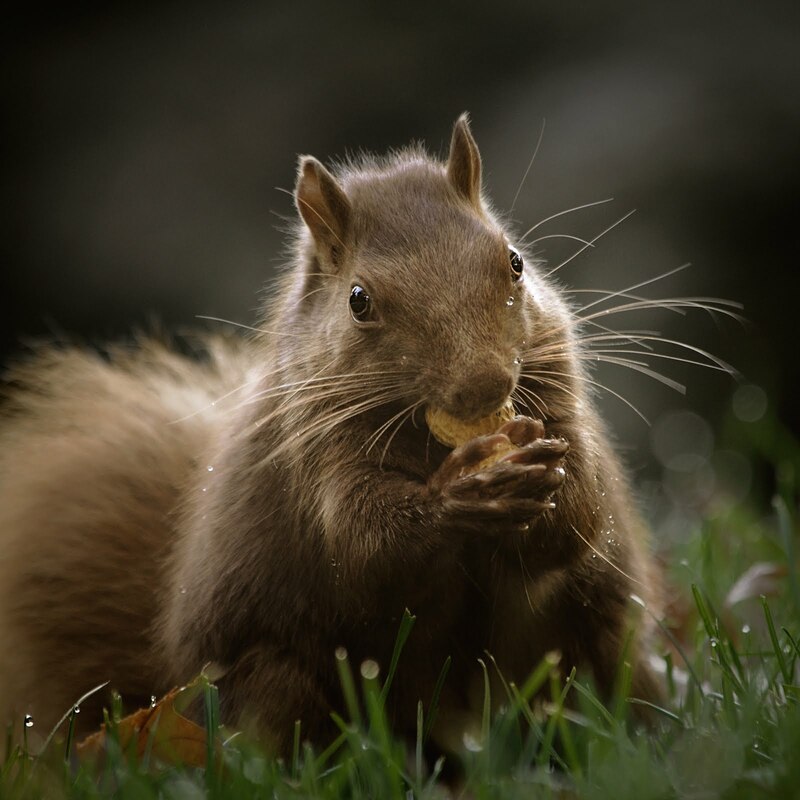 I can see my gazebo canopy whipping all over the place, which makes me worry about my sweet little squirrels that have taken up residence in the corner folds. Poor little things! 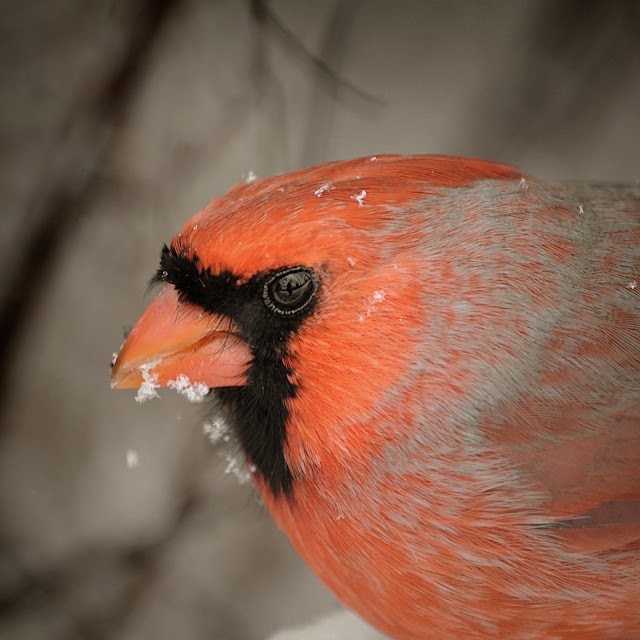 My token male Cardinal shot. I was only a few yards away from him and he didn't seem to mind! "You're just going to stand there and watch me eat, aren't you! Silly human!" "Yeah yeah, I'm cute, whatever. 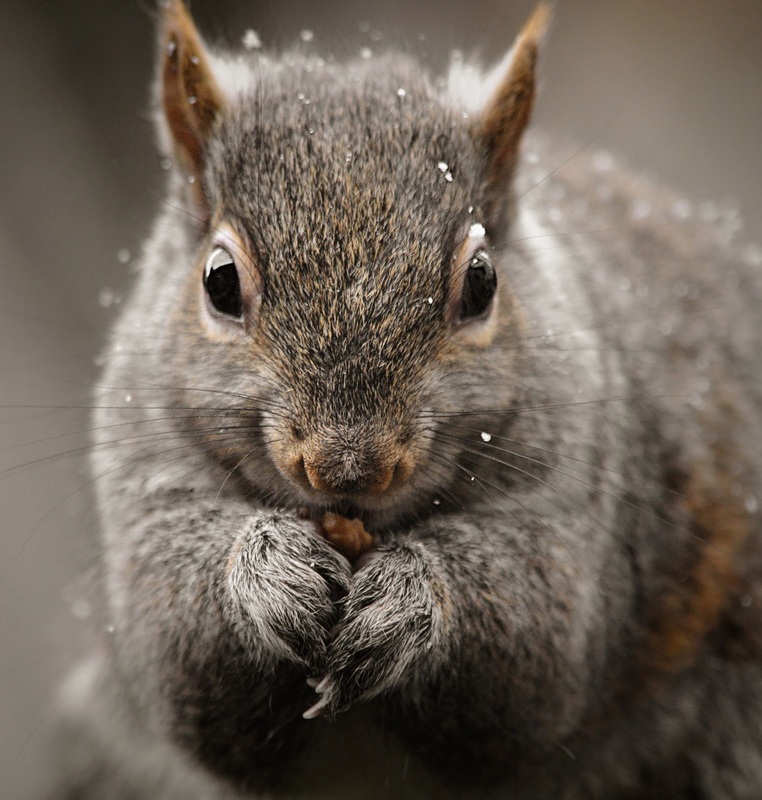 Just keep the peanuts coming, I'm a snowball with ears over here"
"OMG, the buffet is so busy! Not big on crowds, think I'll wait up here 'til the dinner rush is over." 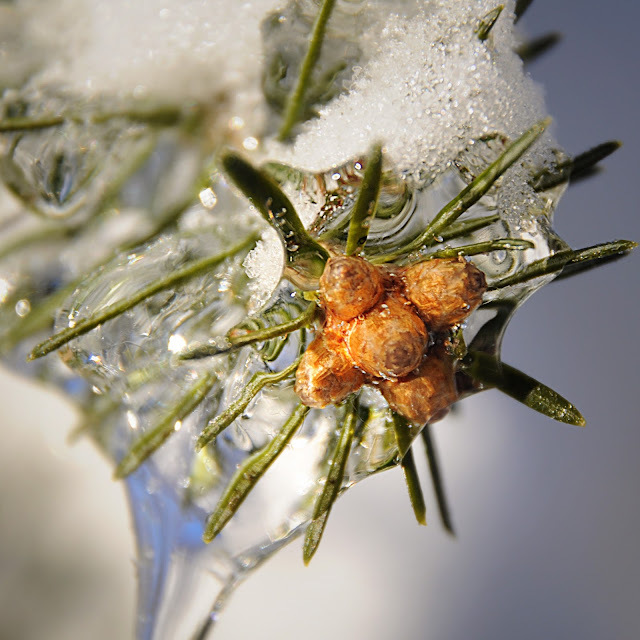 For my macro today, a pine branch and new pine cone buds completely encased in ice! 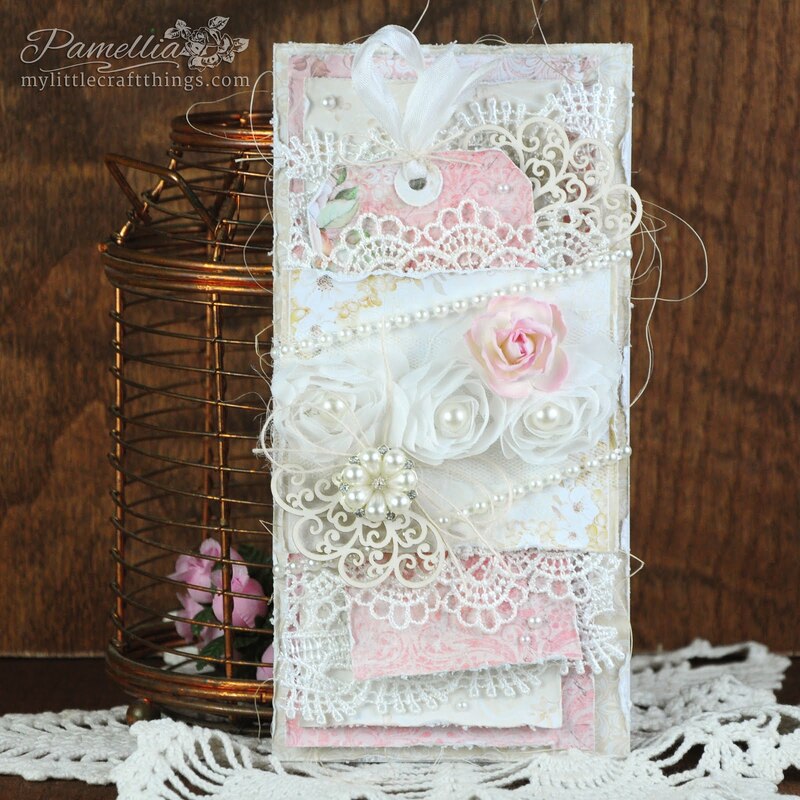 The card is so beautiful and I love delicate colours of the papers and the bird image. 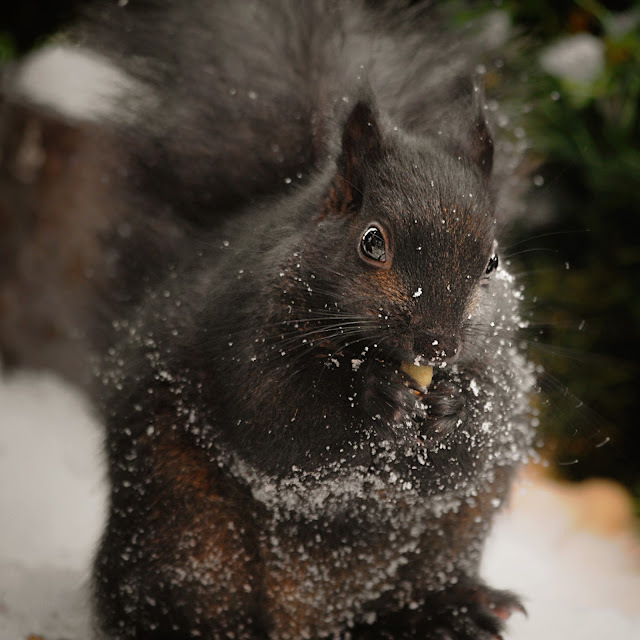 Amazing photographs as always and I hope the squirrels stay safe in their corners. Your card is absolutely beautiful nd so inspirational. Love the added butterflies! Gosh your photography is outstanding. I love the picture of the bird eating from your hand. Amazing that they are so tame. hugs Mrs A. A beautiful card with a lovely air of spring, love the soft yellows and that sweet little bird's nest! 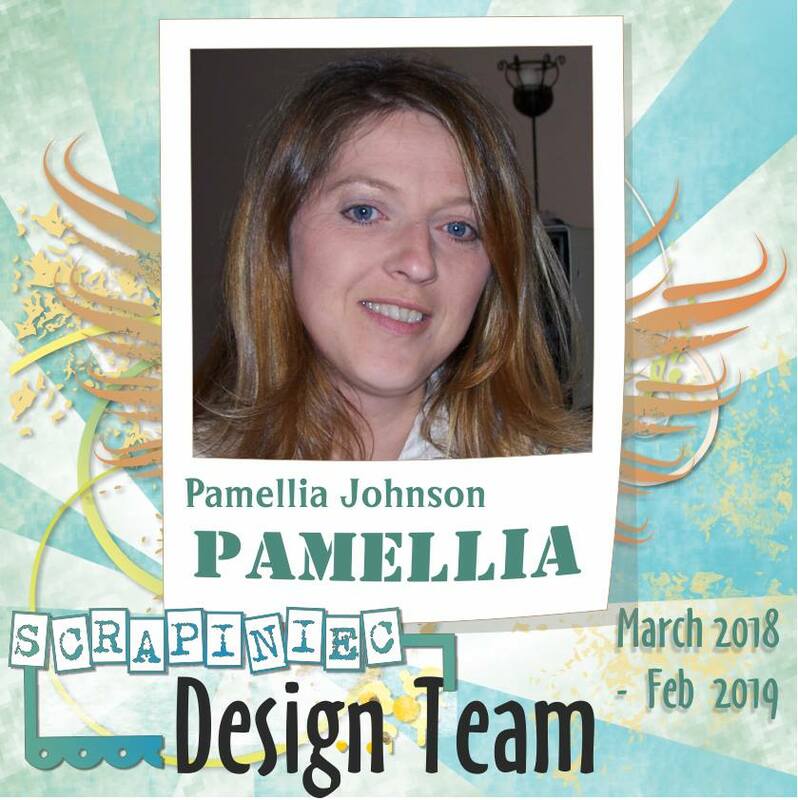 What a pretty, spring card, Pamellia! Love the papers--I just got them but haven't cut into them yet. 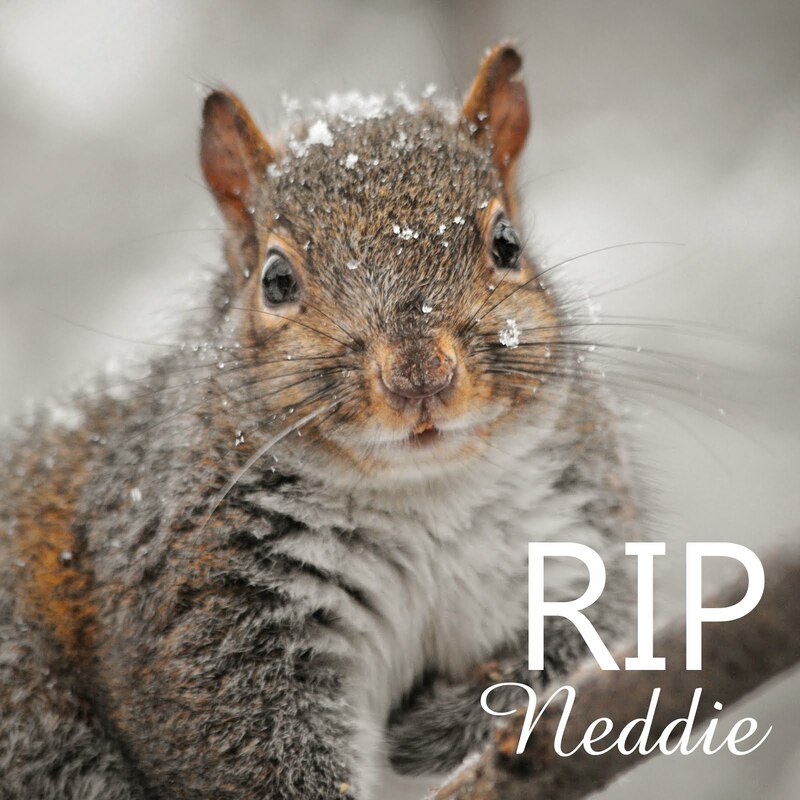 How fun it must be to have the birds and squirrels eating out of your hand! 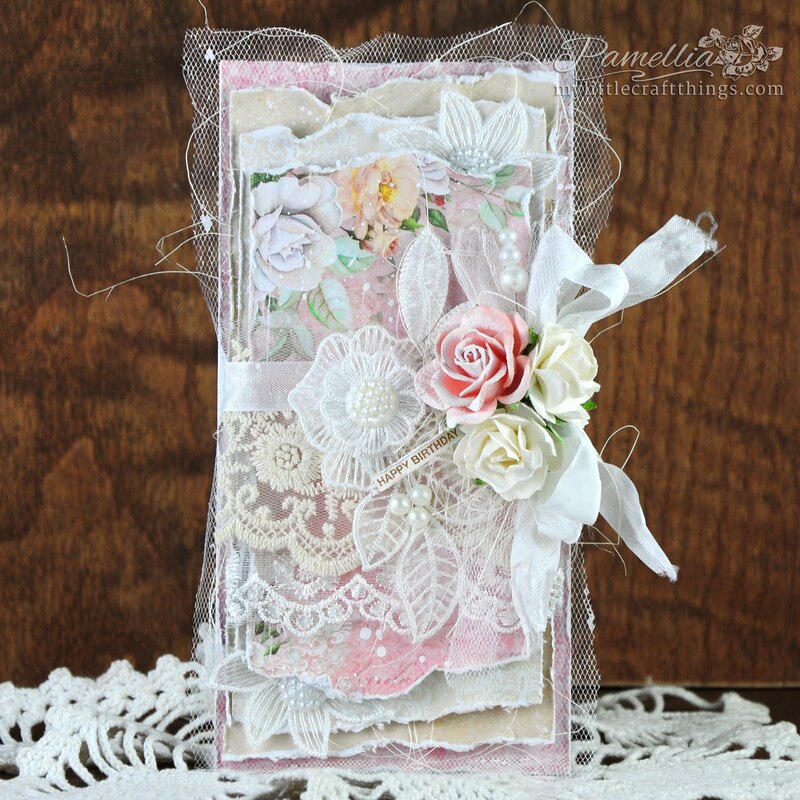 What a gorgeous card Pamellia! 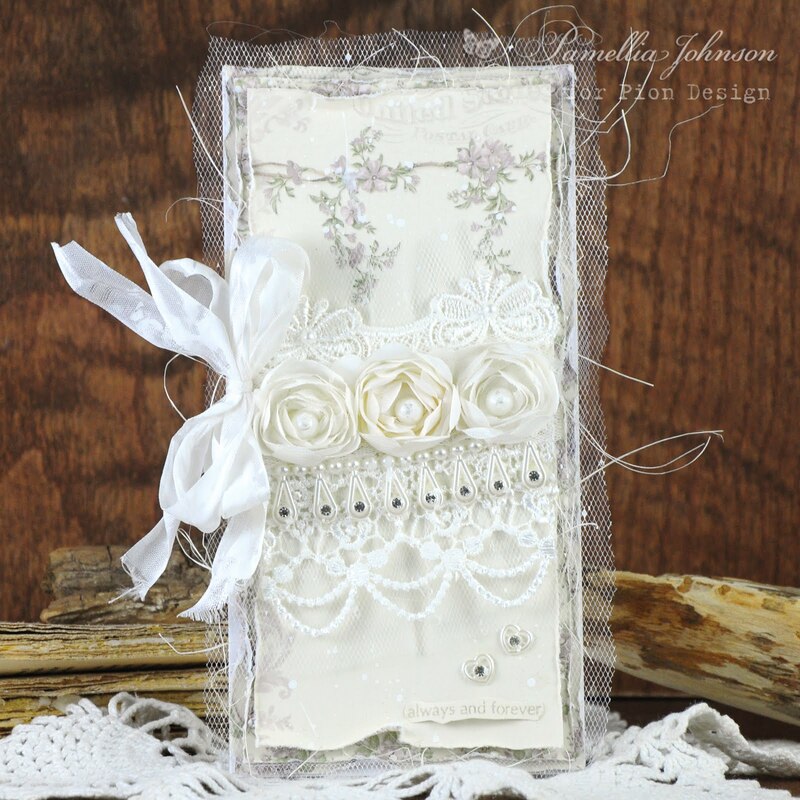 Love the gorgeous design and wonderful choice of embellishments. 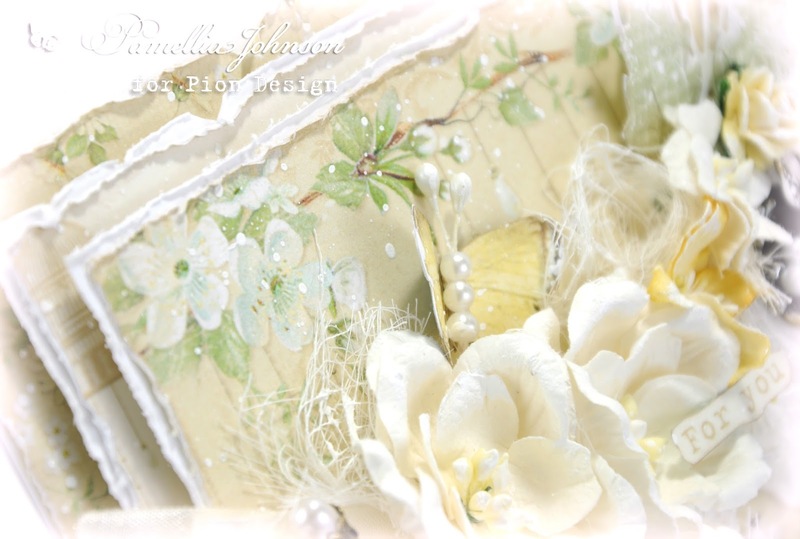 Stunning card .. so soft and warm and sunny!! Love the delicious layers, the lace, the flowers, the sweet little nest with the pearls .. everything is just a total delight to the eyes!! So beautiful!! Gorgeous card Pamellia, the papers are so pretty and your design and embellishments are fabulous, especially that little bird's nest, love it. Hi Pamellia! 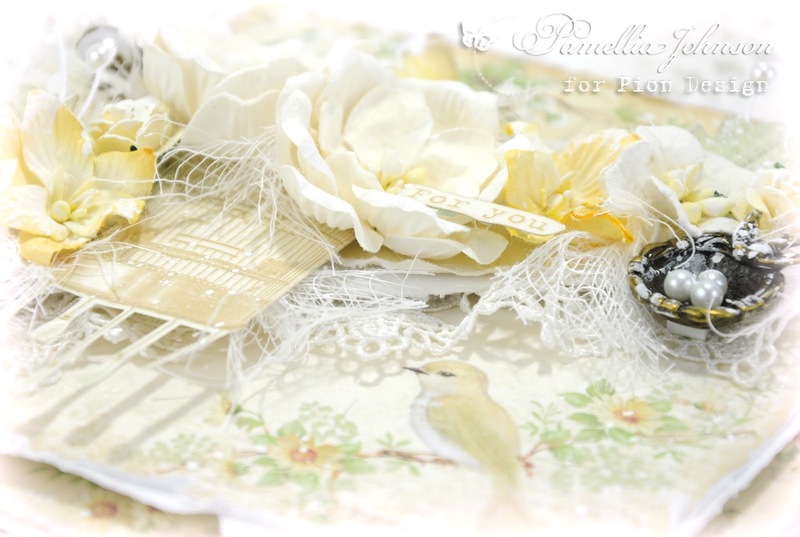 Fabulous shabby card with this yellow, fab papers and such a delight this cute little nest with pearls for the eggs! !So charming! 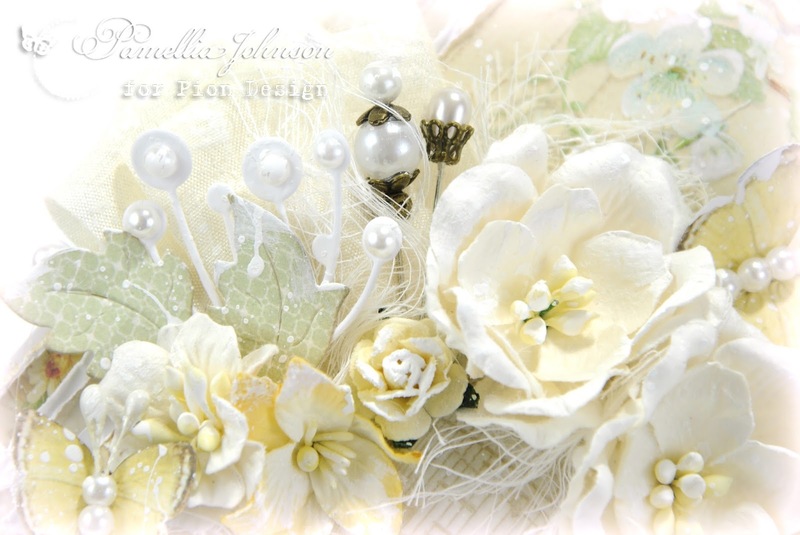 The bird looks very pretty and love the Chloe stems with pearls and the vintage gage! Wonderful design, your cards are always amazing and so elegant! 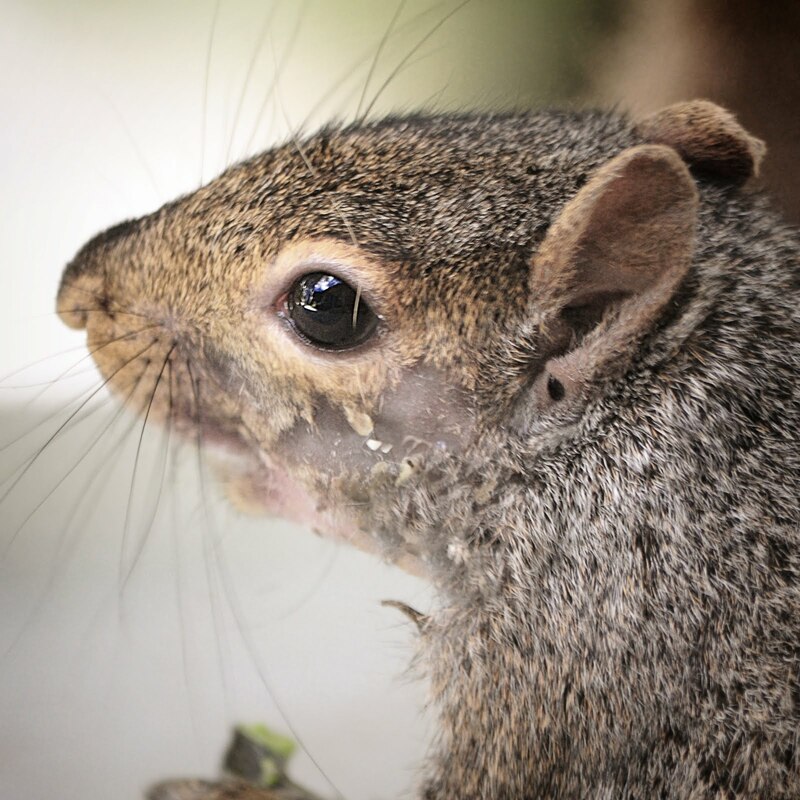 I'm worried for your squirrels that leave in the gazebo canopy. Hope that now all it's ok and that they haven't had damages!!! I have my fingers crossed for them!! 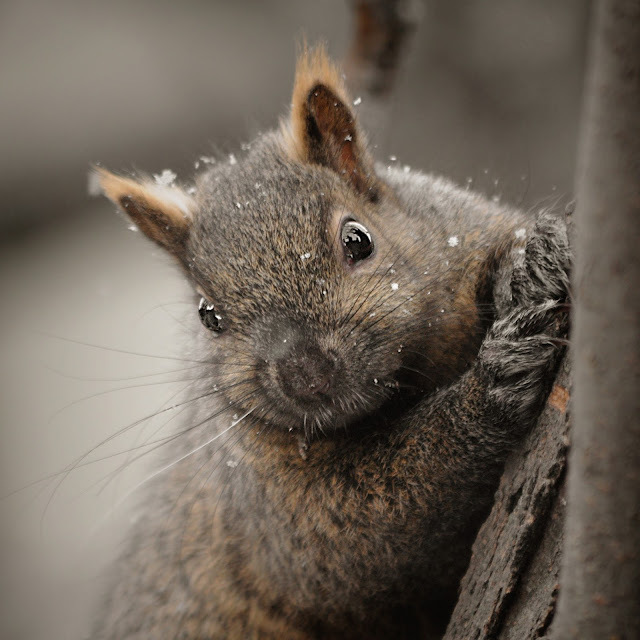 Hugs, here there is rain and cold (but no one snowflake)! Beautiful! I especially love the little nest. Fantastic photos too, as always! 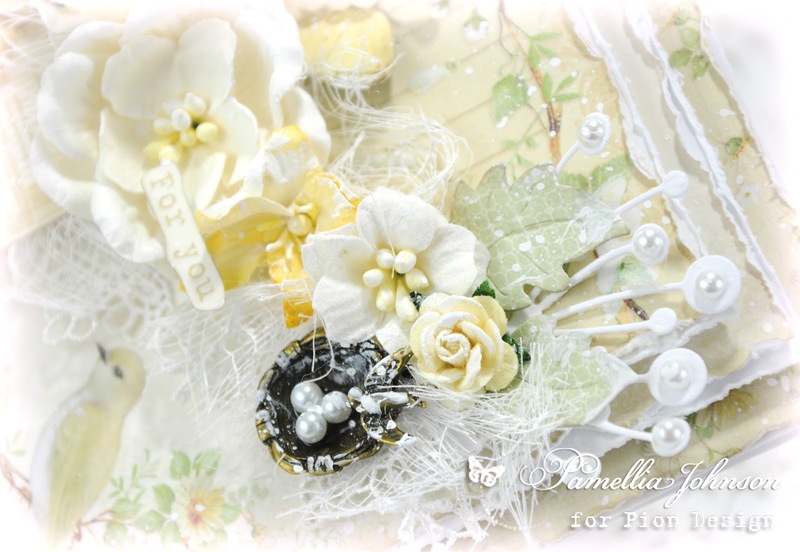 Beautiful Pamellia.I actually adore yellow but never seen to use a lot..probably as I have none.lol..but I love this soft feminine card with the little nest and pearl eggs...gorgeous..
Oh my goodness, this is absolutely stunning, Pamellia!! 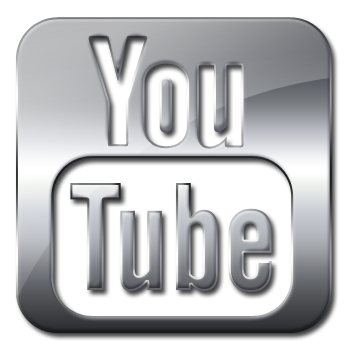 You may not use yellow often, but you use it perfectly!! This is so sweet and sunny...a happy card!! Each detail is amazing!! I love the touches of lace and the gorgeous flowers and the butterflies fluttering about!! I just keep scrolling back up to admire this...truly spectacular!! I love, love it!! as usual your card is very stunning abd superbly created. I love everything about this soft shade of lemon and your superb design. The nest is pure genius too. As usual wondrful and stunning photos of your furry and feathery friends. HAHA, that does seem sort of true sometimes! lol. Thanks Sarah. 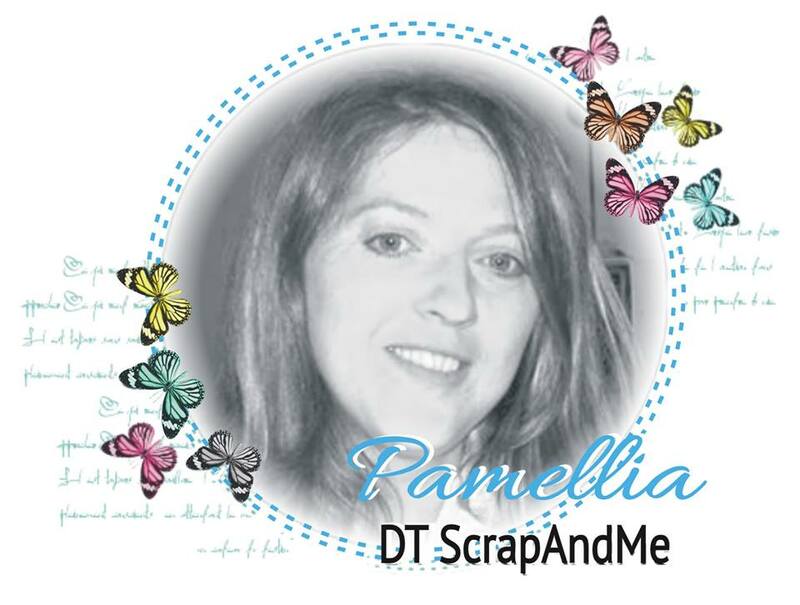 YOur cards are always so perfect Pamelia..I had been missing from blogland and missed your creations!!! 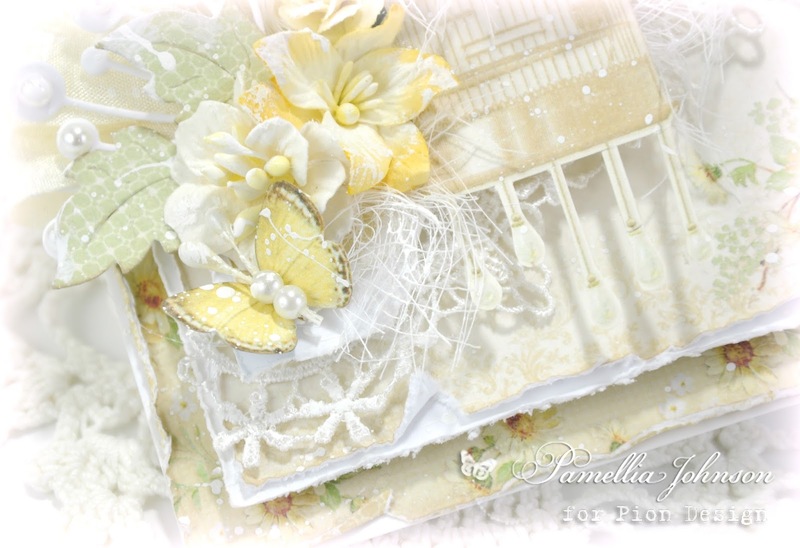 Love this gorgeous creation Pamellia, not a fan of yellow either, but this shade is more lemon to me! it is a beautiful shade, love the layers and details.. 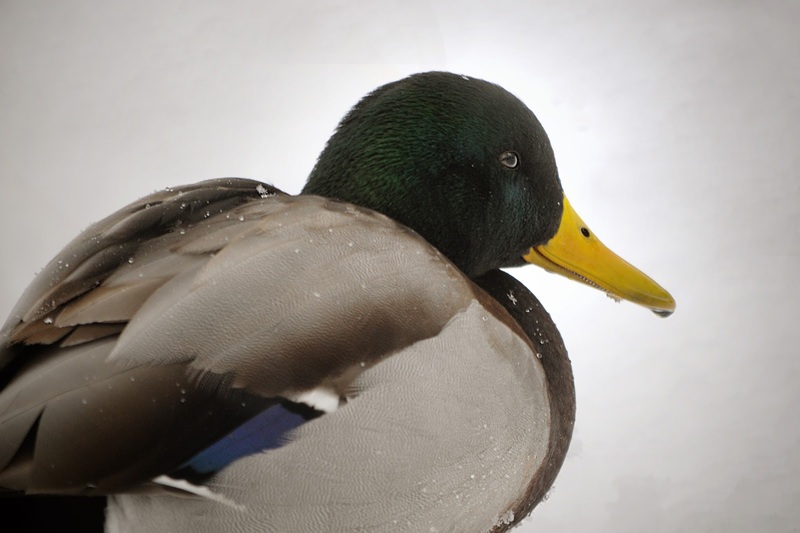 Wonderful photos of your feathered and furry friends with a few scene shots. 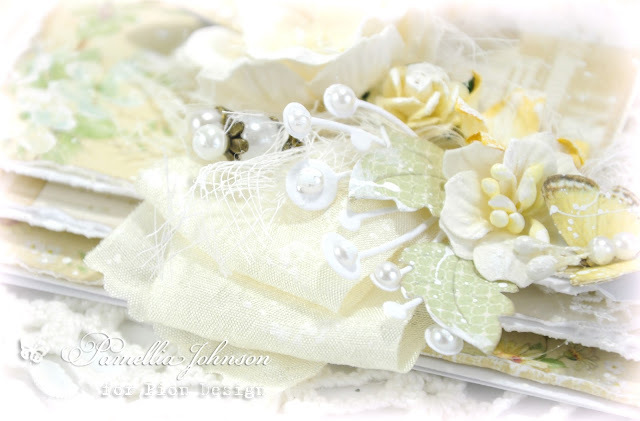 A gorgeous card, the shades of lemon look so delicate on these papers. 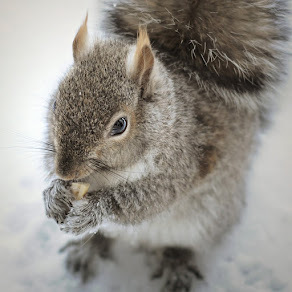 Wonderful photos, the squirrels are adorable, with the snow on there little faces and fur. Thank you for leaving your kind message the other day, it meant a lot to me. I really like yellow cards, they remind me of sunshine and warm sunny afternoons. 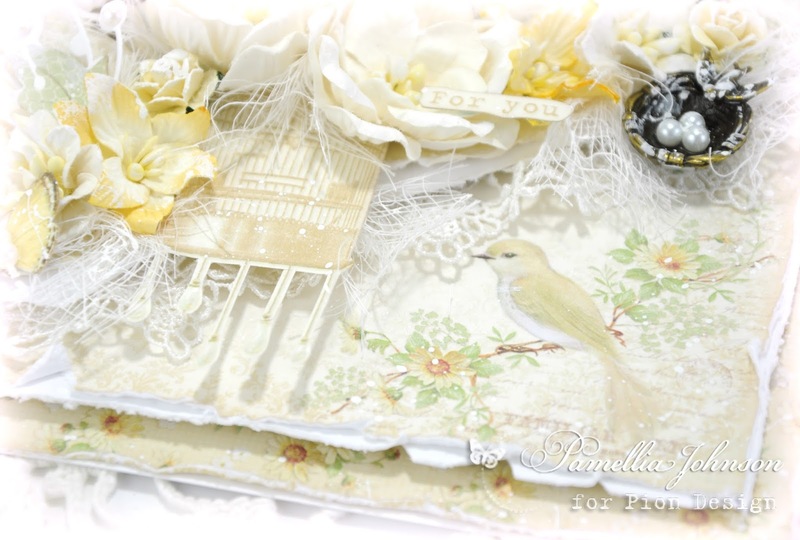 This one is simply gorgeous, with your beautiful birds nest and lovely flowers it reminds me of spring and new beginnings. All of the whispy bits give it a very romantic look. Wonderful wintery shots, I love the way you have shot up through your macro shot and have the blue sky behind, it looks incredible. Beautiful beautiful card Pamellia - love that beautiful shade of yellow too. 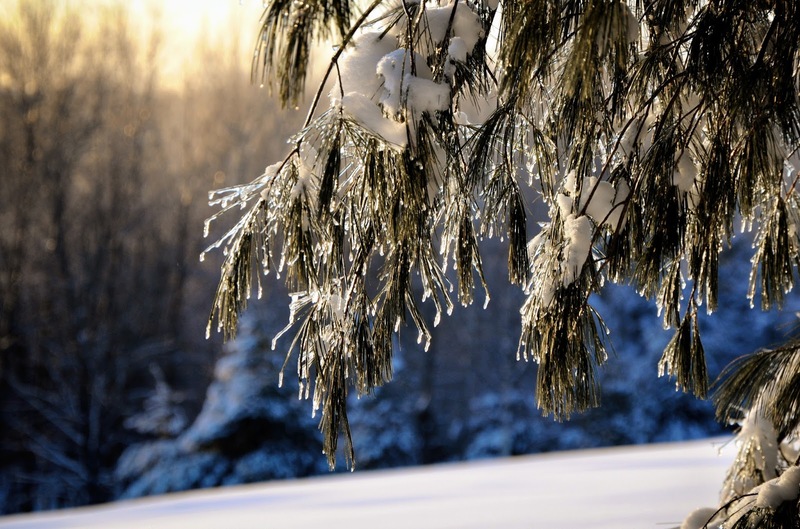 Your photos are as ever beautiful - the photo of the iced pine cones (now that sounds like dish of some sort) is exquisite. I totally agree with you on that yellow, your beautiful card makes me long for Spring even more.... All the photos have the complete wow factore once more, stunning and moving!! I agree with you that the soft, delicate, lemon palette in this collection is very pleasing to the eye and you have enhanced it's beauty with your wonderfully designed card. 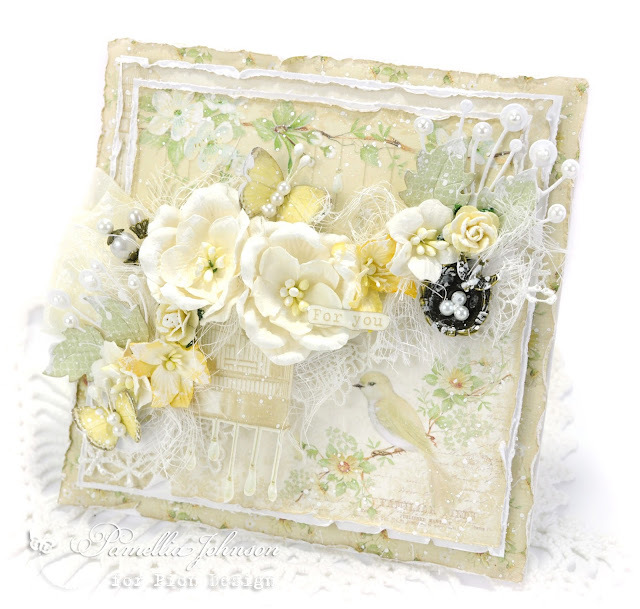 I LOVE yellow, such a happy colour to me, this card is absolutely GORGEOUS , but then what card of yours isn't?, love the little bird and nest addition. and all the flowers and so very beautiful details. Your bird photos are just incredible, wish I could take them so clear and bright AND have them feed from my hand too, just fabulous oh! yes and so is the macro amazing. 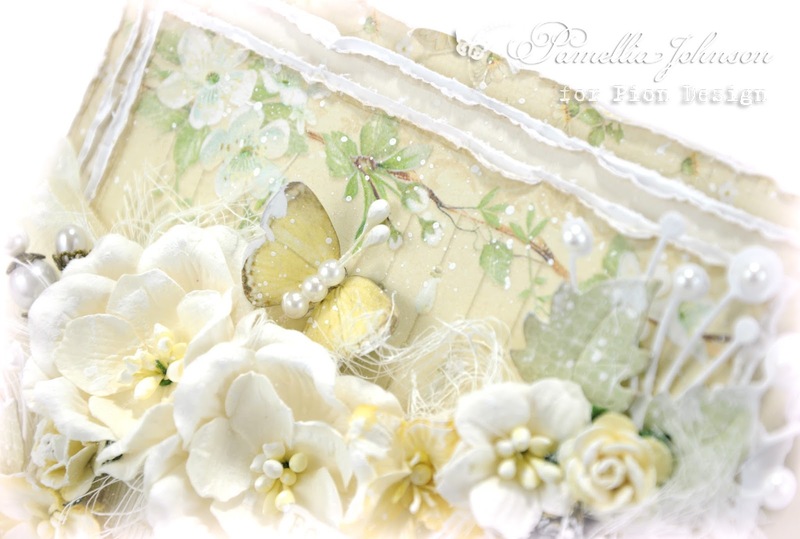 Pamellia, this card is sunshine in paper for me on this stormy morning! 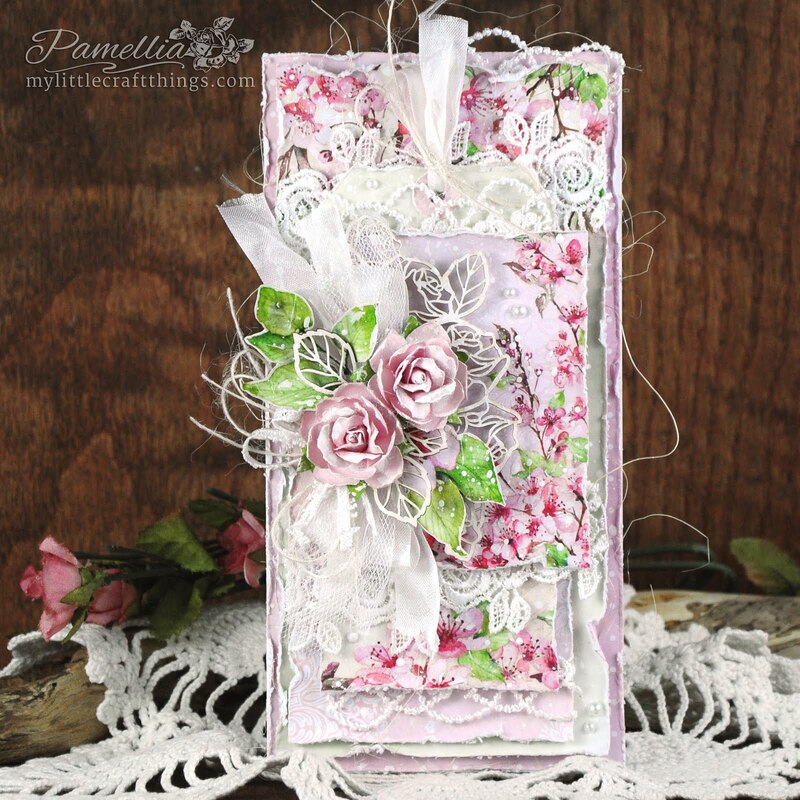 As always, you've made a gorgeous design and picked just the perfect embellishments! Love that sweet little nest and 'eggs', your hand made pins and the lacy bits! Your flowing blossoms look amazing, and I'm just sighing with the beauty of it all! 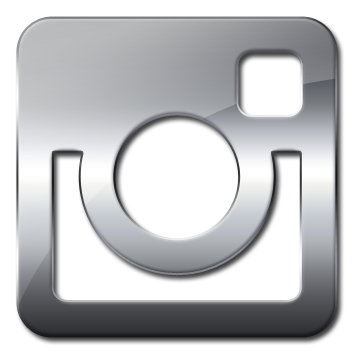 As always, I'm thrilled to see your photography, with your landscape shots being most spectacular! Karen, Matt/Ben, and Patricia are just snugglebuns! And of course, I adore the shot of the nut hatch eating from your hand! Amazing! I have a couple of house wrens already starting to look for a good place to nest in my garage! Spring can't be far off! Sending warm hugs to you, my friend! 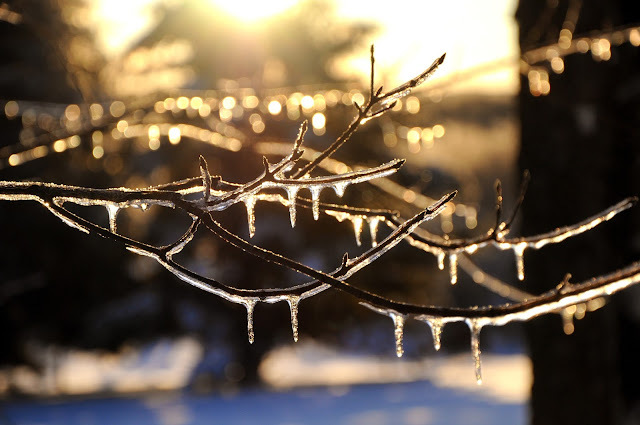 Your photos absolutely mesmerize me Pamellia! 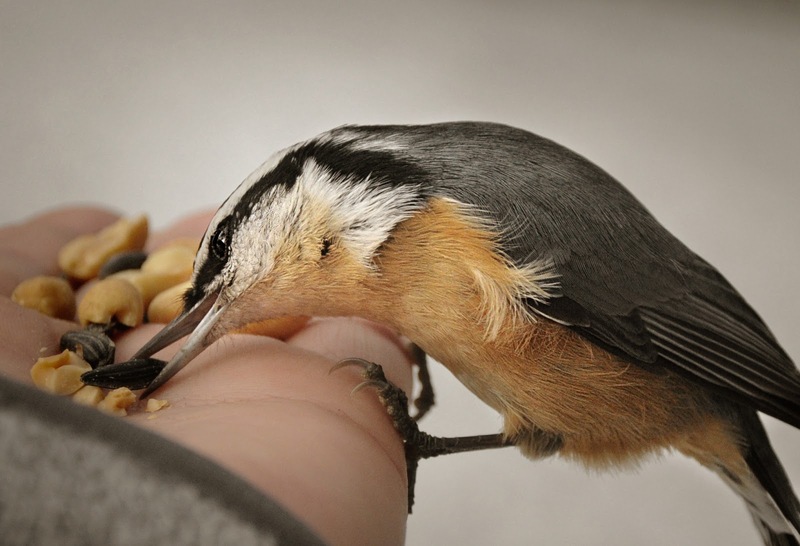 I can't believe you have the Nuthatch eating from your hand, well, yes I can, i saw the photo! Don't you love their sounds they make? We have several at our feeder and they remind me of little robots the way they work their way down to the feed! This card is a bit different - or so it seems to me - pattern wise. I like the way you left space at the top and bottom and ran the flowers in a little dance pattern across the middle sideways like! Don't you love my proper card design language - ehehheheh - but maybe you get my meaning! Anyway - it just seems more gentle and sweet and open. It's lovely. And of course, your babies are so precious. 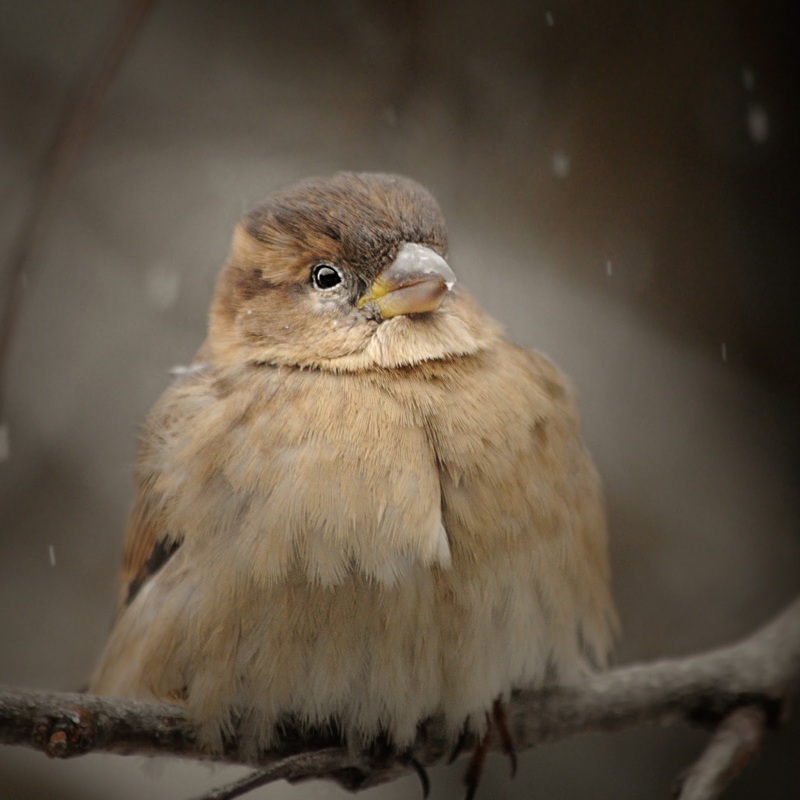 That sparrow is so amazing to see all puffed up with it's feather hanging over the branch to assure no cold air gets in that way either!! And I don't know why but Patricia always makes me smile - well - they all do but she is so shy but nosey. Like the neighbor behind the curtain - across the street!!!! Thanks bunches for the delightful post Pamellia. Thinking of you. Oh and HAPPY VALENTINE'S DAY too!! 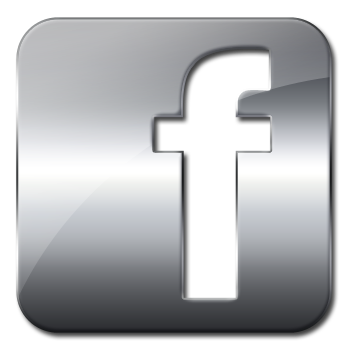 Xj. Beautiful card love the soft yellow and greens sure makes me want to think spring . Amazing photos especially the macro one . 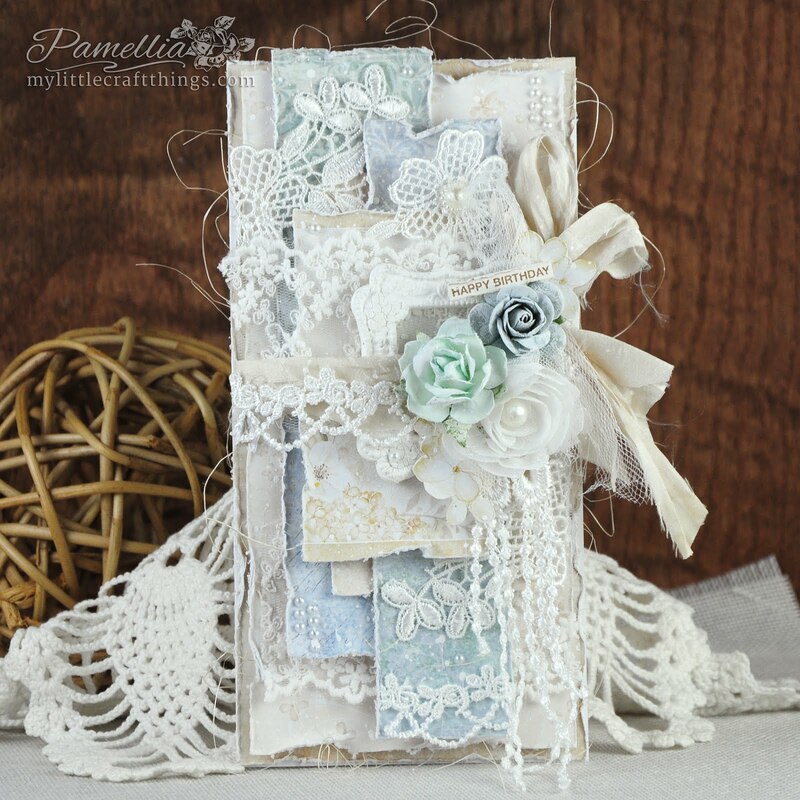 Beautiful card Pamellia, I love how you did the little nest. 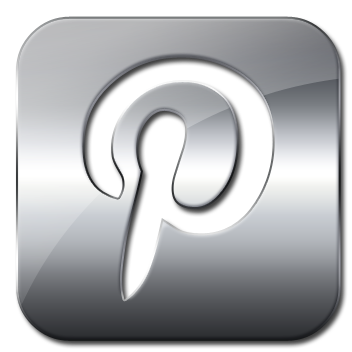 Your pictures are stunning, that macro of the pine cone is pin sharp... and the bird ate from your hand, wow! This card lightens up the heart! Wonderful made and just AMAZING photos Pamellia! Gorgeous card. I understand what you mean about yellow but this is just beautiful. 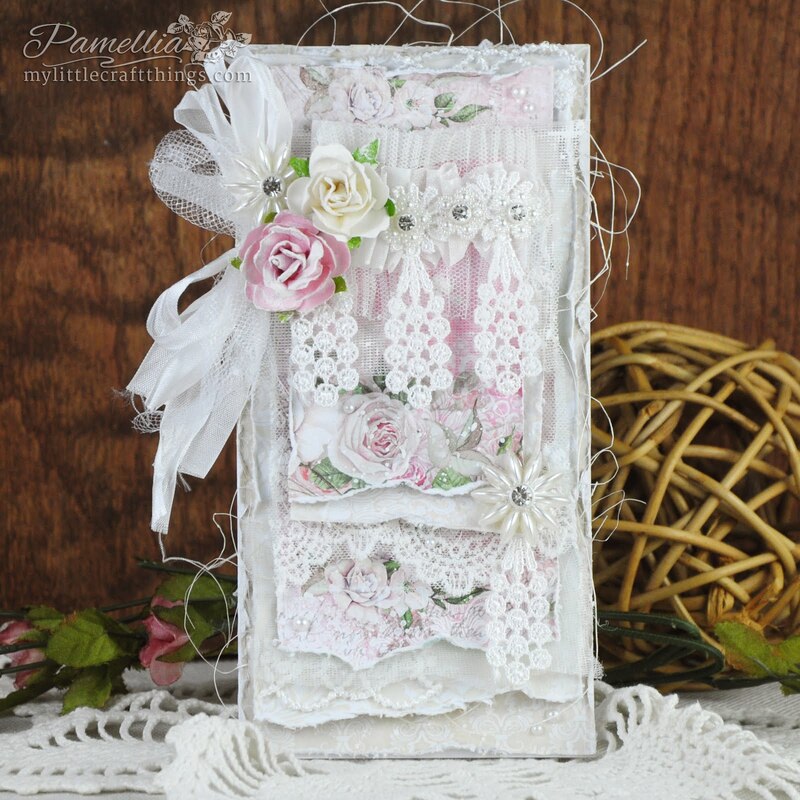 Oh my, Pamellia, I am keep exploring all the stunning details of this spectacular card! Can't take my eyes of it and it's definitely my new favourite of yours! So soft, so delicate and so super gorgeous! You huge talent has no limits, my friend! That macro shot has stolen my heart! Crazy Karen is so cute and I love your captions! You made my day, again! 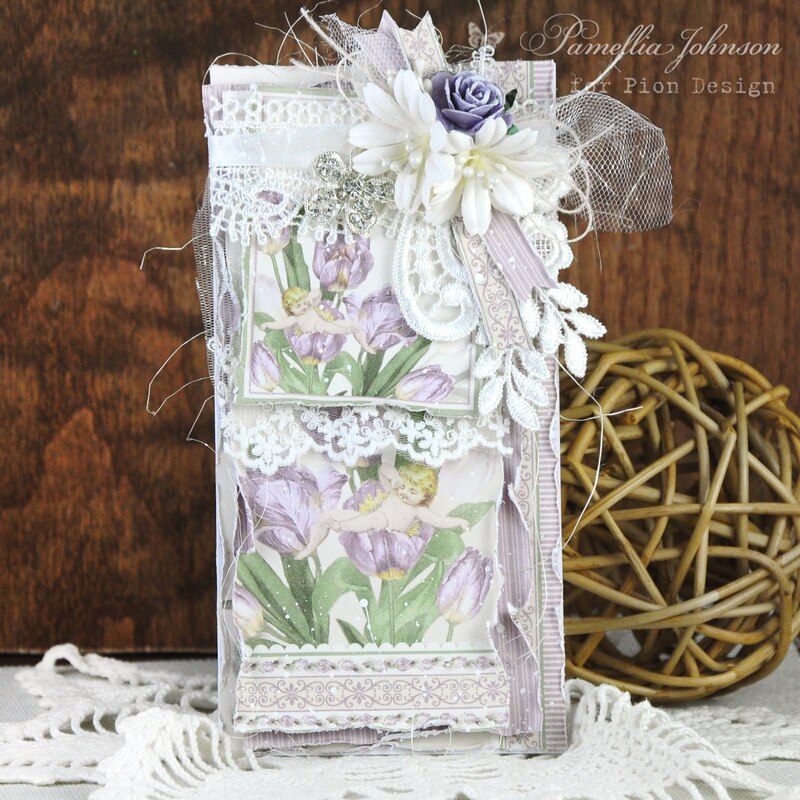 It's a lovely pastel shade so works so beautifully with your designs. Having to play referee with our bird visitors as the Mistle Thrushes are swooping in and frightening everything else. 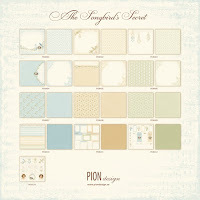 Pion Design - It's a Girl!